ISLAS BELLAS: a fly on the wall? a fly on the wall? One never knows what they're sitting next to while outdoors in Bermuda. You might stand up to find a harmless 'companion' on the wall. Depending on your threshold for bugs & how you keep your cool is another thing. This one looks like a grasshopper, but let me assure you it's the largest grasshopper I've ever seen, about the size of my palm. This one was at the end of the island in St. George & while they do say that bugs at the ends of island are much larger than the more populated areas in the middle of the island, I sure am glad I don't live at either end. There are other bugs that I have a low tolerance for & we all know which ones those are. 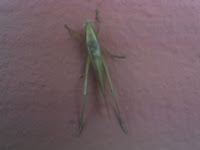 Thats a katydid, although in proper British-English its also known as a 'bush-cricket.' They are harmless. They're quite pretty as well, lovely colours. JS: I was wondering if it was a cricket...but wasn't too sure. Thanks!